Back to Home — Ginger writes. The reason I love our University Model School is that we get to go "back to home" just as much as we get to go "back to school." One of the reasons we picked Greenville when deciding where to move was because of the opportunity for our kids to attend this unique type of school. The way it works is that the students attend school on Tuesdays and Thursdays (once they reach 6th grade, they go to school on Mondays as well). The curriculum is Classical Christian and the pace is rigorous. But what the headmaster and all of the teachers exude - a pure love for learning, for the value of knowledge, for curiosity and wonder, for the humility that comes from education, for the seeking of beauty, truth, and goodness - makes you wish more than anything that you could go back and be ten years old again. New Ikea shelves almost finished. Little cabinet doors will go on the third row down. There is the study of Latin starting in 3rd grade. There are all-school reads and individual class reads. There is copywork, copywork, copywork, and cursive is mandatory. There are numerous literature selections and loads of memory work, both poetry and Scripture. There is math with a vengeance. There is Story of the World and maps to chart. There is a night sky to discover and the periodic table to memorize. There is the Declaration of Independence and the Gettysburg Address. There is art and music and lunch and gaga ball. There is morning recitation time and morning devotions. There is All About Spelling and All About Reading, but it's not all about those things at all. It's all about forming the character of our children and creating in them the desire to know and love the God who made them and created such a wonderful and curious world to explore. We have our children back at home on Mondays, Wednesdays, and Fridays, for the continuation of their education. I take on the role of "co-teacher" and get the privilege to spend time with my kids, learning what they learn and helping guide them into truth after truth. The teachers at school provide the lesson plans for our home days, which helps to ensure that all of us co-teachers are on the same page and have adequate support where needed. There is real life thrown in on home days as well. We have babies to take care of and lunches to make and dinners to prep. We have bottoms to wipe and preschoolers to pick up. We have uniforms and hands and dishes to wash. We have deep desires for time alone and hopes and dreams that extend beyond our children. Yet we carve out time to do this important work that God has given us right now, for these days, with these kids, at these ages. 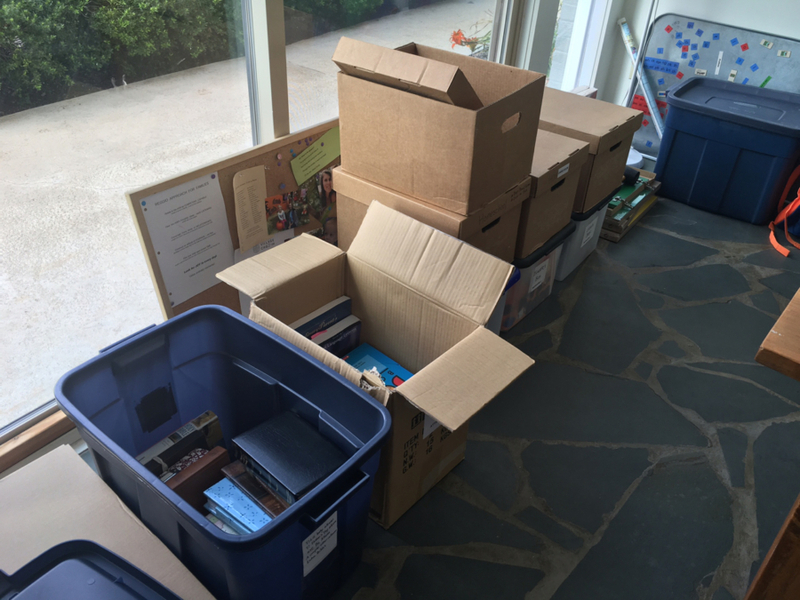 Boxes and bins for old school stuff, photo albums, Bob Books, etc. Last year was our first full year of this type of schooling, and it was both challenging and fulfilling. I loved learning the Declaration of Independence with Bauer and Cash, checking my Latin practice translation sentences against Bauer's work, and reading Cash's class reads slowly and deliberately to him. But the hard part is that on home days you're just so "on" all day long. And if you're anything like me, there's your whole other agenda for daily living that doesn't include homeschool. It includes things like Bible study, exercise, meal prep, writing letters, and alone time. That's my piece to work on this year, or better yet, to surrender to the Lord: to let my agenda be whatever God has for me on a particular day. I want to find joy in the journey (who cares if that's a cliche?) and let the learning we do together be a light and a balm to my soul. When we say Colossians over and over this year in memory work, I want it to transform my heart and mind. When I work with Story on reading, I want to not be thinking of what to add to my Trader Joe's list so I can truly enjoy and celebrate her progress. I want to build Cash's self-esteem through doing hard things together, and I want to not let Bauer just be "fine" off to the side doing his own thing. He needs me as much as Sailor needs me, but in very different ways. "I have become all things to all men so that by all possible means I might save some," is what Paul wrote in one of his letters. I want to become what Story needs, what Cash needs, what Bauer needs, each in their time, as they grow and change this year. The goal is not to win some award for Best Co-Teacher, or Most Efficient Morning Schedule, or Quickest Memory Work. The goal is to win the hearts of my children to the love of learning and to the love of Jesus. I am so blessed to have my mother-in-law coming to stay with us this fall to take care of Sailor each morning so I can focus more easily on Bauer, Cash, and Story on home days, and on my writing on school days. It is only a recent development that Nana is coming, but I'll not say No to God's perfect timing in providing for us in this way. School Supplies: My dog's name isn't Gizmo. Over the summer, we've occasionally gotten email updates on school-related items in preparation for the year ahead. We must prepare our schooling spaces at home. We must prepare our children's uniforms, school supplies, and expectations. And more than anything, we must prepare our own hearts. Thankfully, we are not left to our own devices to do that last hardest bit. That's going somewhere big and bold for me this year. I want to see it every day because I want to be a better teacher, a better mom, a better wife, and a better servant of Jesus Christ. I find motivation to take better care of my soul so I can take better care of my children's souls. God has probably just been waiting for me to ask. God of my soul, will you lead me this school year to people, words, moments, occasions, even circumstances, that provide what my soul needs to be healthier? I need soul rest and I also need soul strength. I often think I know what will provide one or the other. I forget to start my day with open hands of surrender, but instead start with hands making breakfast, or hands lifting weights, or hands blow-drying hair. Even as I do these very important tasks, I pray that my heart will be lifted to You and my prayers for soul-help will reach You. I pray for joy with my children this year, and that what we create in this "back to home" space will be hearts turned toward each other and hearts ultimately turned toward You, knowing that You are a good, good Father. We long for healthier souls, each one of us, so that we may shine Your light into all the dark places in and around us.